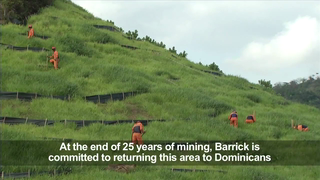 See how water quality in the Dominican Republic's Margajita River has improved since Barrick's Pueblo Viejo gold mine opened in 2012. The river used to be colored dark red due to untreated, acidic water discharged by a previous mining operation. Barrick's state-of-the-art water treatment plant now treats all water from the mine site to international standards. Also, people who live in communities around the mine have been invited to participate in the mine's environmental monitoring program.